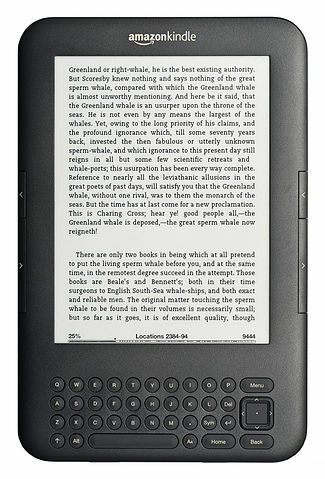 Amazon Kindle 3 by NotFromUtrecht – Own work. Licensed under CC BY-SA 3.0 via Wikimedia Commons. This article studies the pedagogical effects of using Kindle™ readers for accessing texts in an English classroom in 2011. The results demonstrate minimal changes in learning as a result of using Kindle devices for reading and writing, but predict the likelihood that students of the present and future seek to access texts in multiple modes using multiple platforms (like laptop or desktop, smartphone, and e-readers). Two librarians and an English professor at the University of Georgia received a grant to provide Kindle 3.0 readers “to be used as an integral part of the writing classroom experience for students” (p. 283) in a literature and composition class. The three developed a mixed methods study to assess students’ “comfort with and use of technology, their preferred method for reading different types of texts, and their experience with the Kindle at the beginning, mid-point, and end of the semester” (p. 284). The researchers concluded that pedagogical aims were neither more nor less effectively accomplished with than without Kindles. “None [students] noted either benefit or liability in the use of the Kindles for learning” (p. 291). Although learning outcomes were not affected, researchers noted that some students struggled with disorientation as they transitioned from print text to e-text. The researchers recognized the value of disorientation: “We as professors and instructional librarians would be wise to expect and even encourage new tools in the classroom; the disorientation that accompanies these evolutions is often paired with new and valuable possibilities” (p. 293). The Kindle afforded searching, highlighting, annotating, and bookmarking, but not every student found those features useful. In fact, librarians and professor alike found students taking notes on paper with Kindles in hand during class sessions. The researchers realized that students accessed texts in multiple formats as conditions dictated. Some found print copies easier to read and annotate. All used their Kindles for reading, but most also used other digital devices to access texts. I found the conclusion that students “prefer access to materials in multiple formats” (p. 293) most interesting. This suggests that teachers must be prepared to support and provide information on multiple platforms for our students. Provide Kindle section numbers and print page numbers for readings. Expect students to highlight and annotate electronically and write marginalia in print copies. Evaluate the fairness of asking questions about repeated uses of words as part of textual analysis, given the e-reader’s ability to conduct full-text searches. Determine whether an e-reader’s ability to “read” the text back to the student is adequate to grasp its meaning and significance. As a result of the study’s sharp focus on Kindle 3.0, I would recommend this article only to colleagues seeking information about the use of e-reading devices and/or e-reader software in classes. However, colleagues seeking insight into the future of digital text access will likely find the study informative.